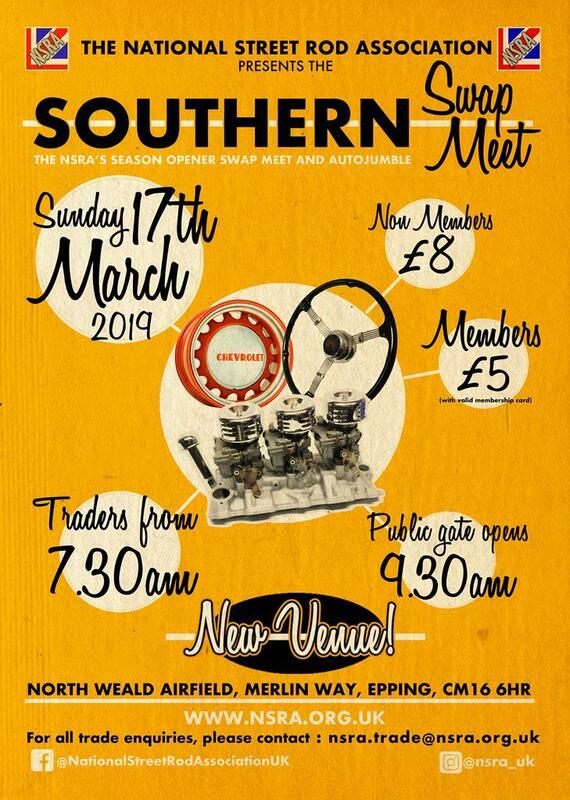 Our rodding events calendar opens with our huge outdoor swapmeet and autojumble – from a window winder to a complete car, this is the place to buy and sell new, used and vintage auto parts and accessories! The public gate will open at 9.30am and you will be asked to wait with your car in a holding area before proceeding to the main car park until that time. Please be aware that there will be no facilities in this area – catering vendors will be available once you are in the main enclosure. Entry prices are £5.00 per NSRA member on production of a valid membership card (fridge magnets are not acceptable! ), and £8.00 per non-NSRA member. Children 17 and under are free. You will be asked to pay whilst in your vehicle – please prepare yourself with the correct cash and relevant membership card(s) to keep traffic moving. As North Weald is an active airfield, there are strict rules on rubbish. Please do not litter, use the bins provided or take your rubbish home. Traders admission is from 7.30am on the morning of event. Pre-book your trade pitch to benefit from FAST TRACK ENTRY on the day. Booking forms are available in the January issue of Street Gasser Magazine or available for download at www.nsra.org.uk/southern-swapmeet . On the day entries will be held back until the Fast Track entry has cleared. Cut-off date for trade pre-booking is Friday 8th March 2019. Vendors are to refrain from trading before 9.30am as this allows for un-interrupted set up. It is also fairer on buyers and vendors alike. Please also be aware that all trade pitches are in the open and overnight camping is not available. We look forward to welcoming you all and hope you pick up lots of bargains! i like that idea more than North Weald. I would take all kinds of stuff to Ardingly if it was down there but of course that would be further away for many people. i wonder what is being built on Arena Essex site? It’s definitely good for thought. It’s still “south” so would meet the Southern swap meet criteria . And may even bring more traders/ hoarders from south way? Anyway I’m saving now to get ready to spend on stuff I definitely will not need lol. Thanks for the venue suggestions - suggestions are always welcome and if you think of any others then please do message me. Ardingly has been looked at, I know it well as its only down the road from me. See you in March.....bring thermals!! I just hope the traffic flows in here better than it did at Arena! See you in March! but hey! not to dwell! i only have to drive thru that area every now and then, and not live there! Thermals are ready, See you there Slammage! Ticket arrived today! Early bird entry......we will see! Looks as though the wind is going to die down by Saturday and rain may be held off for the most part, Fingers crossed...tightly! Low on numbers both stalls and buyers, but it was bearable, wind, sleet, hailstones and sunshine on/off throughout the day. I sold things i didn't think i would, and other bits i thought would go straight away..........? are still on the back of the truck! Lots of bargains to be had, and many were taken! Friend of mine bought a genuine 3:54 diff..£50! And typically, it's been gorgeous today! Poxy British weather! There were a lot of bargains to be had, but as always, you get the dealers coming round trying to buy what they can to flog on their own stalls and mark up the price as well, but each to their own, and as always, you offer a really good deal, but it's not enough??? The first thing i sold was all of the hot wheels i possess, approx 150 of them, £50! oh well, see what the rest of the year brings!